Genotyping creates an inter-individual biological profile that enhances the conclusions of observed abnormalities in participant groups. 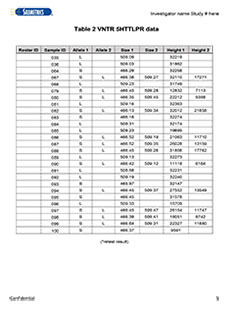 The SalivaLab’s DNA isolation protocol yields high purity, low salt DNA with A260/A280 ratios (indicating protein content) consistently at or above 1.8 and the A260/A230 ratios at or above 1.5. 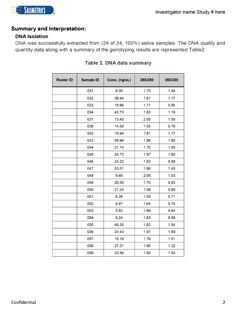 These high quality results with low sample retest rates allow for confidence in DNA data with exceedingly low non-reportable findings. This provides researchers a cost-effective service for targeted DNA genotyping, bringing ease, affordability, and painless sample collection to researchers. By optimizing the extraction process, Salimetrics protocol enables researchers to expand the scope of their studies by including specific genetic markers for genomic testing without the need for specialized collection devices, preservatives or complicated collection techniques. For studies focused on a targeted number of SNPs, VNTRs or STRs, Salimetrics' new protocol enables researchers to incorporate the efficiency and simplicity of using the same saliva sample for genetic analysis that researchers use for other biomarkers. 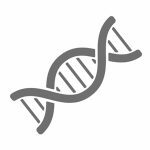 Explore genetic markers of interest at SNPedia a wiki that shares information about the effects of variations in DNA to help identify SNP’s of interest. Salimetrics can test any SNP listed in SNPedia. The Salimetric DNA extraction procedure was specially engineered to produce high-purity genomic DNA for downstream genotyping applications. The quality of our DNA has unmatched reliability specifically when used for SNP analysis, yielding on average just 2 undetermined genotyping results per 1000 tested. DNA genotyping is convenient and easy to add to your study when testing at Salimetrics. Simply identify which SNP’s you want to test (https://www.snpedia.com/) and request a quote. When performed at Salimetrics, DNA can be extracted from the same SalivaBio swab used to collect saliva requiring no expensive DNA-specific collection devices. The first step to successful DNA analysis is high quality DNA isolated from your saliva samples. Genomic DNA Extraction is the process of purifying the genetic material from the cell nucleus and other cellular components. Purified DNA can easily be stored for further genetic analysis. Poor extraction methods yield ambiguous or non-reportable genotyping data which results in the exclusion of those individuals from your study. 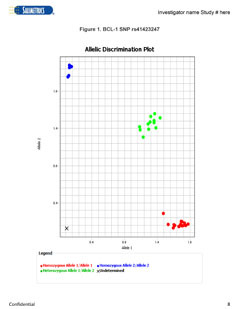 Salimetrics offers SNP analysis for any SNP(s) on SNPedia with at least one peer-reviewed publication. Single nucleotide polymorphisms (SNPs) are copying errors made during DNA transcription while a cell is starting the replication process that allow for genetic diversity. SNPS are as common as one in every 100 to 300 base-pairs. A single base pair is substituted, subsequently changing the genetic code and resulting in a different translation of proteins. An alteration in a genome from a SNP has various outcomes such as altered stress levels, predisposal to certain behaviors, and susceptibility to several diseases. In turn, these factors will alter analyte levels. Identifying SNPs as the reason for these alterations is crucial for more control in your research. VNTRs (meaning variable number tandem repeats) and STRs (short tandem repeats) are small fragments of a DNA sequence located at a locus that reappear without interruption (end-to-end repeats). Nucleotide base pairs in these hypervariable regions are grouped off and named by the size of the group that is repeated. For example, a group of ten to sixty nucleotides is called a minisatellite and a group of exactly two nucleotides (i.e. ATATAT) is called a dinucleotide repeat. While VNTRs are classified as minisatellites, STRs are commonly classified as microsatellites, and are a smaller group repeated sequences between two to thirteen nucleotides in length. VNTRs are useful to determine parentage, as one VNTR is inherited from each parent, as well as for a plethora of other reasons such as finding the source of an outbreak. STRs are commonly used to discriminate between unrelated individuals and for DNA profiling.